Hello Friday. It is so nice to see you again. Ours was big and little all at once. Soccer season is in full swing. Practices at two different parks. Games at two different fields. How, wise sports parents do you do it? Because it all seems a bit daunting. Any wisdom you could throw my way would be much appreciated. The girls wonder all summer what their team colors will be. Neon green and fluorescent yellow weren't exactly on their top ten list of choices, but you get what you get and you don't throw a fit. 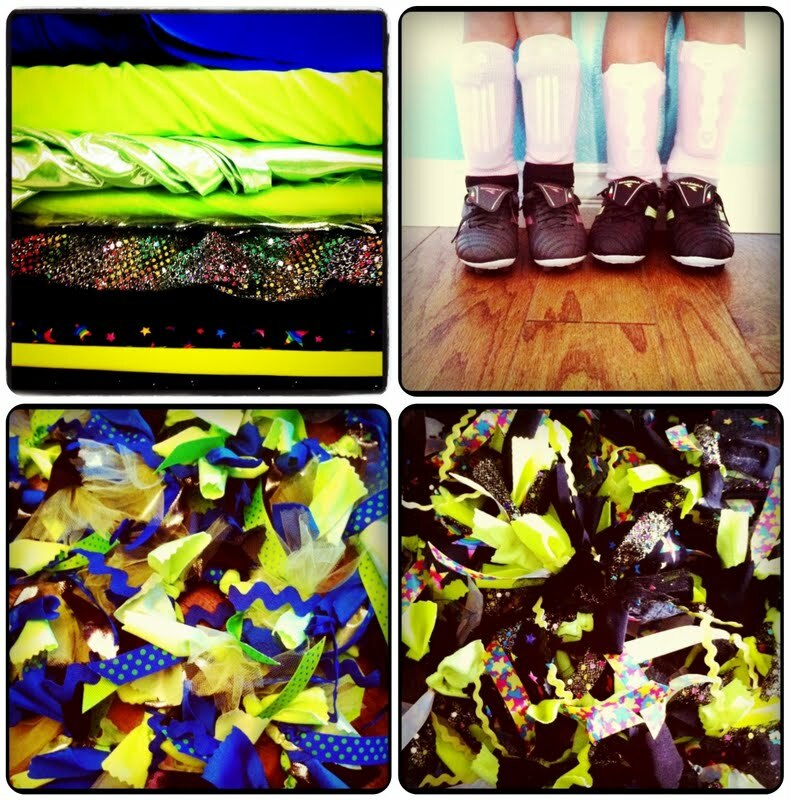 Unless of course you are the sucker who volunteers to make the bows for all the girls on both teams, and your eyes start bleeding from all of the neon hot mess that is covering your cutting board. My shopping cart at Joann's looked CRAZYTOWN!!!! 1. Jason is reading through the Chronicles of Narnia to the girls each night. It's the best. The time he spends with them, their little imaginations growing and stretching, magic. 2. Narnia played into our own little lazy Sunday. It only would have been more perfect with some Mr. Pibb and Red Vines. Crazy delicious. 3. The project I started and abandoned a few weeks ago is finished. The Pottery Barn letters require a degree in quantum physics to hang up properly. In my old house they sat upon a shelf. Sadly the shelf was destroyed in the move. I had to come up with something that I could glue them to, since I a sadly lacking the whole pesky degree. I like. A lot a lot a lot. 4. 5. & 6. I also like my dear friend Cholula, sour cream, my beloved kitchenaid, and sweet friends who bring treats. Thanks Maureen. They were ridiculously good. 7. Pandora gets me. It knows just what I need to hear, just when I need to hear it. 8. Fun (not fun) fact. Don't sew over fabric paint. Unless you like broken flying needles. Shane is conveniently hiding the area that the sewing machine ate. That's it for this fine first week of September. Family, soccer, school, food, powertools, C.S. Lewis, music and sewing. That is what my favorite days are made of. 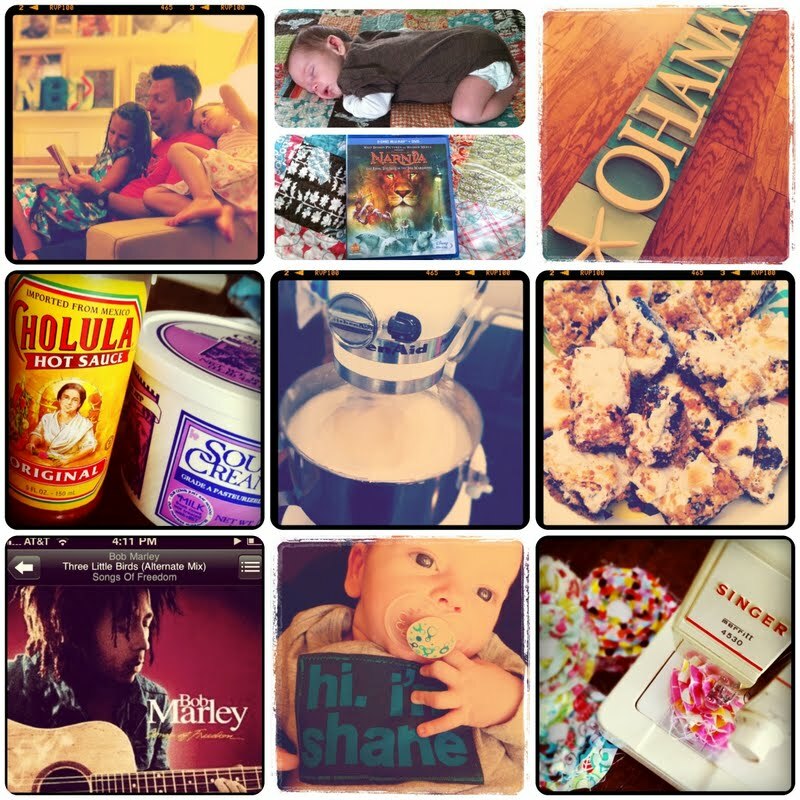 Link up your favorite simple days with Life Rearranged. Hi there. I like Shane. You survive two soccer games on different fields with good snacks and juice! We have been living this life for a few years now and it does get easier the older the kids get. My youngest is 20 months. I love listening to your week on Friday!! I love your insta fridays! Have a happy weekend! I love your insta-Fridays! I would love love love if you decided to open your shop back up! A tutorial on those hair bows would be pretty awesome too, they are adorable =) Good luck with soccer on two different fields. You are a super-mom, if anyone can do it, you can! I have 4 kids that play competitive sports and boy is it a challenge! I discovered this week that I am going to be living in my car between 2pm and 7pm most days with quick entrances and exits in my house for snacks and a changes into practice clothes. Our weekends are completely filled with games all over So. Orange County. As crazy as it all is somtimes and as much as I think that I am going to lose my noodle, I just LOVE that as a family we cheer each other on and get to watch each of our kids excel doing what they love. It's a busy, busy season of life but I know that I will look back with tons of amazing memories and no regrets. I would love to buy something from you if you reopened your shop. I have been waiting forever to buy a necklace from you. I love that your husband is reading narnia to your girls. my dad did that when I was young (second of three girls then a younger brother) and I read them recently and it was all familiar and like coming home - I loved it!! Open your shop. Make lots of quilts. And give them all to me. Good bye. I'm hoping someone offers up some great wisdom for having 2 kids in different places at the same time without going insane too. And I know this is only the beginning. But the main question I have is what do you make out of the hot sauce and sour cream? Love the Lazy Sunday reference. Every time someone says "true" I reply "double true". I usually get a blank stare. I get the same stare when I pay with a ten and say "Watch the way I'm dropping Hamiltons baby!" I love the wood behind the letters. Can I ask where you got it? Yes! Please reopen the shop... I need new flowers! 2. Love Narnia. I alternate between it and Little House books, pulling out a Narnia before they release a new movie on DVD. Family fun time, and a spiritual message? Winning! 3. Your little man is adorable, congrats! OH soccer. So tiring. I am a single mom that has been somehow getting VEY lucky over the years and have only had my kids' games overlap a few times. This year my youngest started playing select which requires SO much more traveling, so I did what any self-respecting mother would do... I called my dad and cried into the phone.."Daaaad, I need help. Wanna be a soccer dad again for the second time?" He obliged and has helped me out of a few scheduling conflicts already this season. It just takes lots of sacrifice which I know as a mommy of 4, you know all too well. You will get the hang of it. Like my dad said...tomorrow you'll wake up and they wll be grown and gone. You hope for friends on the teams for carpooling if necessary. You plan meals (or plan $$ in the budget to eat on the go). You try to keep a cheerful attitude about it all. And you keep perspective and realize that if someone (or everyone) is just too tired on a given day that no one won or lost a scholarship in little league sports. It is okay to put sanity above sports. We have four kids on four different teams (3 sports). We love sports. A lot. But we also love each other and we constantly talk about how to make it work for our family (that includes the two younger siblings not yet playing sports). shop. shop. shop!!!!! that is all. you should just go ahead and open that shop. yep.